A luxury dark chocolate bar made with criollo cocoa, and created by the renowned maker Akesson’s. This 75% Criollo bar is a great example of the influence of terroir on taste, and a rare one at that. To put it into context, this estate produces 300 tons of Trinitario cocoa every year, but only 2 tons of Criollo beans are available to be harvested separately to make this bar, a very limited supply. In 2018, these Åkesson’s Criollo beans were awarded Heirloom Cacao Preservation (HCP) status. Today bars made with his beans win prizes all over the world. This expressive single-origin dark bar, crafted personally by Bertil in France, is an award winner too, boasting a whole host of gold awards as an exemplar of single origin dark bars. 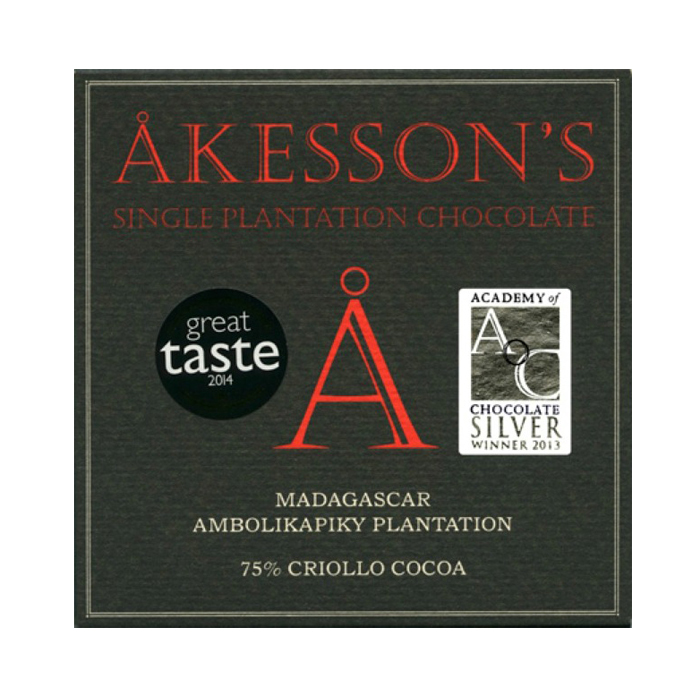 It hails from Åkesson’s Ambolikapiky plantation in the celebrated cacao producing region of the Sambirano Valley, North-West of Madagascar. Indeed, many of the world’s best chocolate makers and chefs use cocoa from this estate. May contain traces of nuts, almonds, milk, gluten & wheat. Very smooth, notes of dried porcini, earthy, pronounced acidity. Pretty good. Pleasant all round, but with an olive-oil texture somewhere around the middle which was just a touch bland. Did not linger too long (shame), but overall enjoyable. I really love this bar. Nice and sweet berry notes with a lemony aftertaste, I can't help but reach for more chocolate! Certainly a strong roasted cocoa flavour with the right amount of sweetness, making the chocolate very satisfying. The first Akesson's bar I've tried and I look forward to trying the others.